Celebrate Asian American and Pacific Islander Heritage Month with these Artists! Asian Americans make up the fastest growing population in the U.S. and have been involved in the American music scene since the early 20th century during the Jazz Age. While a few artists, like Chinese American cellist Yo-Yo Ma, have become household names, many others left the U.S. to create music for Asian markets due to American media’s lack of acceptance for Asian American musicians. That’s starting to change with the rise of social media and popularity of indie music, which has helped springboard acts who were once considered outsiders in mainstream entertainment. 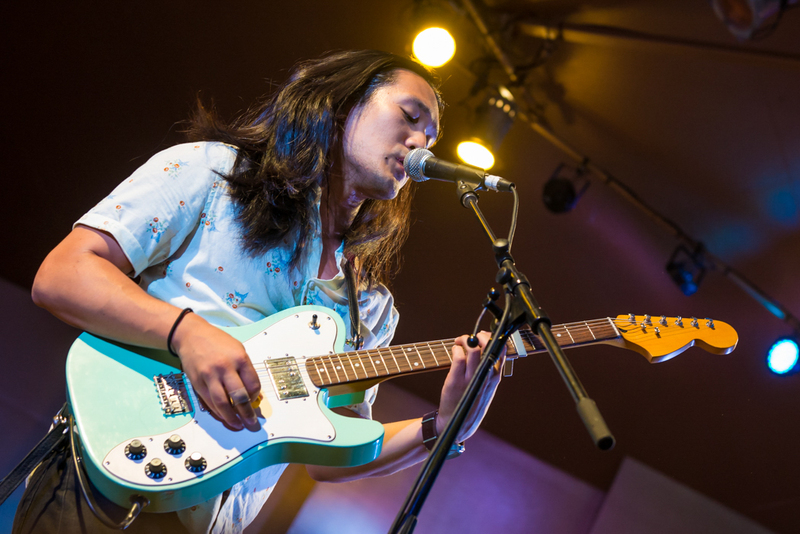 Over the years, Levitt concerts have featured Asian American artists performing an array of genres for music lovers nationwide and will continue to do so this concert season. In honor of Asian and Pacific Islander American Heritage Month, here are five Asian and Pacific-Islander American artists who have performed on or are about to grace Levitt stages. Check out the videos below to hear some new and fan favorite songs! Singer-songwriter BettySoo from Austin, Texas, has graced several Levitt stages with her melodic vocals accompanied by the sounds of her acoustic guitar. Her emotional lyrics and pitch-perfect falsettos received airplay on local radio stations, leading to back-to-back South by Southwest showcases in 2012, 2013, and 2014. BettySoo has also played a variety of folk festivals across North America, and with her featured performance on BBC2, BettySoo has made her mark on the worldwide folk music scene. Don’t let the name of Chicago-based Funkadesi fool you! Though the term “Desi” loosely refers to South Asian culture and diaspora, Funkadesi blends musical styles, including reggae, Latin, and yes—Bollywood and bhangra—to create a fun take on world music. Funkadesi’s genre-bending nature is inspired by the band’s multicultural roots in Puerto Rico, Jamaica, southern India, Punjab, and more. Their enthusiasm for cultural music encourages a mixing instruments like the sitar, congas and tablas. Funkadesi’s lively performances even caught the attention of President Barack Obama back when he was a senator of Illinois, who exclaimed at one of their shows, “Funkadesi really knows how to get a crowd fired up!” Levitt AMP Sheboygan will be showcasing Funkadesi’s unique take on world music on August 18, making this performance the group’s first on a Levitt stage. One of the most renowned Hawaiian musicians, Keali’i Reichel’s interest in the genre began when he realized his passion for his native Hawaiian language and culture. Reichel, who began as a hula teacher (called a “kumu hula”), began composing traditional and contemporary Hawaiian music for hula students studying Hawaiian dance. At age 33, he produced and released his first album of traditional and modern Hawaiian music titled Kawaipunahele,and his subsequent album Lei Hali`a won a Na Hoku Hanohano Award, often referred to as the “Hawaiian GRAMMY.” Since then, Reichel has gone on to win 18 more Na Hoku Hanohano Awards and has toured the U.S. mainland and internationally both as a musician and a teacher of Hawaiian culture. Hailing from Southern California’s San Fernando Valley, indie rockers Run River North got its start performing local events, coffee shops and talent competitions in Los Angeles. Before the formation of the band, lead singer Alex Hwang wrote the song “Monsters Calling Home,” inspired by the experiences of his Korean immigrant parents. Hwang’s lyrics about the pursuit of the American dream’s impact on immigrants resonated with his Korean American friends and future band members. In 2012, the group achieved national attention after filming a music video inside their Honda cars. The automobile company rewarded the band with a performance on late night show Jimmy Kimmel Live! More recently, Run River North have kept their momentum going with a performance on Late Night with Seth Meyers as well as at major music festivals such as South by Southwest in Austin, Texas, and an upcoming gig at the annual Summer Sonic Festival in Japan. Kudos to these artists who have earned the respect of music critics and fans alike despite the challenges of gaining traction as an Asian American musician. Is there an Asian American or Pacific-Islander musician you would like to see grace a Levitt stage? This entry was posted in Levitt Artists and tagged Asian and Pacific-Islander American Heritage Month on May 6, 2016 by Lucy Truong.